Where can I use SeeWithMe? Remember, you can always add products we don't have by registering or logging in. For products without barcodes, you can also print custom barcodes using your account. You'll need to be connected to the internet to use SeeWithMe. Either Wi-Fi or cellular data - we're not picky! You will also need to ensure that your volume is loud enough to hear (press up on the volume buttons on the side of your phone). In case your volume is too low, the app will notify you by vibrating when it is opened. Once the app is open, it will audibly alert you that it is ready to scan. It will be helpful to know where your camera is located on your phone when trying to find the barcode. Hold your phone about six inches (one to two fists) away. You can either move your phone around the item, or rotate the item in front of your phone. The app will let you know once the barcode is scanned, and read the product name out to you. After that, it'll be ready to scan the next item automatically. That's it! To learn how to open the app with your voice, see here. If something doesn't have a barcode, sign up online to create a custom barcode. With your account, you'll also be able to add barcodes not yet in our database. Tip: moving the product in front of the camera will help your phone to focus and items to be scanned more quickly. 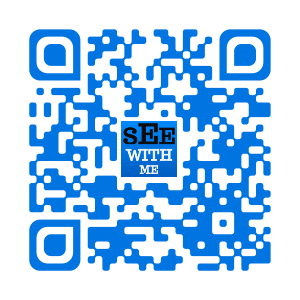 Scan the following barcode with SeeWithMe to hear an audible version of the instructions.